I am a VA Accredited Claims Agent. I help veterans and their families in Alabama understand long term care benefits from the Department of Veterans Affairs (VA). Most veterans are not aware of the eldercare benefits available through veterans health care, through state veterans homes, through home renovation grants (HISA Grants), or from two disability income programs called Compensation and Pension. One particular program called Veterans Pension or more commonly known as the "Veterans Aid and Attendance Benefit," can provide money to pay for home care for veterans. Aid and attendance can also be used to pay for assisted living for a veteran or the veteran's spouse and for nursing home care for a veteran or the veteran's spouse. It's astounding that roughly 1/3 of all seniors can qualify for up to $2,230 a month in additional income through Pension under the right conditions. Yet government statistics show only 5% of potentially eligible veterans are actually receiving the Pension benefit. This benefit can help you pay anyone including your child for home care. It can also be used to help you pay for professional care in the home, for assisted living, or for nursing home. Imagine having an extra $2,230 a month that you didn't even know existed. Proudly serving all of Alabama. Click the above to open. Click here to find / request Military Service Records, Discharge Papers, or Prove Military Service. Below is an NBC Nightly News clip from February 23, 2007. Please watch the short video for more information about VA's Aid and Attendance Benefit. What is the Veterans Aid & Attendance pension benefit? Who is eligible for the Veterans Aid & Attendance pension benefit? The special case of Long Term Medical Costs. Using aid & attendance to pay any person for care at home. 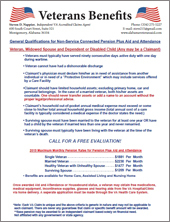 Using aid & attendance for professional home care. Using aid & attendance for to pay for assisted living. Using aid & attendance for to pay for a nursing home. The application process for aid and attendance Pension. Using an aid & attendance benefits consultant. When the family can submit a claim without help. When the family should use a benefits consultant. Learn about Disability Compensation & SMC. Learn about Dependency and Indemnity (DIC). Learn about Burial and Memorial Benefits. Learn about Home Improvements and Structural Alterations (HISA) Grants. Learn about State Veterans Homes & VA nursing homes. Learn about the Best Health Care System. Learn about the VA Health Administration. Learn about Enrolling in Veterans Health Care. Veterans benefits can help you pay anyone including your child for home care. They can also be used to help you pay for professional care in the home, for assisted living, or for nursing home. Imagine having an extra $2,230 a month that you didn't even know existed. We provide information about veterans' benefits including what they are and who can qualify. Only individuals who are accredited attorneys, accredited agents, or accredited service officers can be involved in the preparation, presentation, or prosecution of a claim.